“I am passionate about music, arts, sharing ideas that inspire, laughing and different cultures from all over the globe and how music plays an important part in each language. Heidi Joubert was born in South Africa on 4th May 1987 in Pretoria. There was not a moment in life that Heidi recalls not having music as part of her life. Her mother is a pianist who used to practise classical pieces in the background while Heidi and her 4 siblings played legos or monopoly. Singing was the first instrument that Heidi could instantly reach and grab and as she grew up she never spent much time without singing (simply to herself). Having grown up without any TV, Heidi had to feed her own imagination with stories through her music and her love for composing and writing was also evident at an early age. She also danced ballet for a bit and loved acting. At age 6 she started taking her first piano lessons with Maestro Usias van der Merwe (Head of the classical department of the Technician of Pretoria in those days, the same teacher her mother had). Her piano lessons with him continued for only a few months as she found classical piano to require more time and dedication than she could give, she had other instruments she was interested in learning too. She also started playing drum kit as her brothers had a band and turned the garage into a studio with a drum kit. They used to play Grunge, Rock and Metal. Heidi’s first beat on drumkit was played on a Nirvana song at age 4, but she only later really picked up the drums. During high school Heidi also started taking up the Saxophone. She went on to do a 3 year Music Matric diploma (Kinda like Rockschool for Highschool instead of the standard subjects) which she completed in 2 years, graduating as top drummer, singer, composer and pianist of her class. One week before Heidi’s 18th birthday she immigrated with her parents to the UK to London where a wild adventure awaited her. She wanted to study at the Guildhall music school but she did not have the finances for it, and was not legally allowed to work as she was a ‘dependent’ on her father in the UK. She then started busking to make some money. First on Saxophone, then she formed a duet with guitarist Sebastian Diaz as singer. Heidi will say that busking was the best university she could have gone to! She busked professionally all over London, Cambridge and the UK for over 8 years. During her very early busking years she got introduced to the cajon and Heidi taught herself to play the cajon through countless hours of busking on the cajon. It was during these years that she got very much exposed to Flamenco, latin and world music and she started to venture into these styles with a desire to learn more about the cajon, the music and the cultures. She added a few video lessons on cajon and what she had taught herself on Youtube in the hopes of helping other people who found themselves in her position; no teachers and no material to learn cajon. She wanted to share what she had figured out about the cajon through a lot of trail and error over a number of years. Those videos started becoming popular as the cajon was also still on the rise to becoming popular. 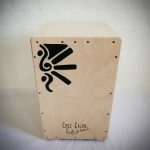 Heidi decided to start a blog page with more info on the cajon and more lessons to create more awareness of the cajon and share the wonders of this awesome new discord with the rest of the world. She also started up her own brand of Cajons that she sells on her website, and she runs the only cajon school in the UK based in London. Heidi was asked to become Roland international Elcajon and percussion artist, and was the face of the worlds first hybrid cajon, the Elcajon EC-10 by Roland. The Elcajon was launched at the NAMM show in California and it was Heidi’s first gig as Demo artist. She won ‘Show on NAMM’ award, gave a private demo to Sheila E and even had Stevie wonder join her onstage for a jam during one of her demo’s. Hey Heidi, couldn’t help but notice your surname being Joubert. Does your family have any roots in the Seychelles be any chance? Our closing family friends were Joubert when I was living there. Tell me what language you are singing in your cover of Sway? Thanks. It’s so beautiful. Hello Pam! I sing Sway in English but I do have an improvised part I do on the song at times, and the language I use is simply made up, almost like the concept of scatting but using more of a concept of real ‘language’ which I find helps me to improvise and express myself better. I consider it a Spiritual language! 🙂 Crazy I know, but then again, all language was made up by people at some stage in our history so not so crazy after all. Hope this answers it! I actually do this quite often in many of my songs, I find it gives me the ultimate freedom as an artist. Heidi, I love what you’re doing…sharing the music, spotlighting the cajon box. So with no drum background and @40, I hope its its not too late for me to learn Cajon. But considering you as my e-mentor, i am now now plunging into the Cajon magic. I just wish to say thanks to you for all the in videos and tutorials you have posted. Wish me luck ! a Cajon is basically an amplified table with snare wires so that’s perfect. Its never to late to learn percussion, its a very fun and useful tool and will help you in every aspect of your musical career. good luck to you. Let me know if you need help with your order and all the best with being a super awesome daughter in law! 50 To. 500 pounds is it worth starting out with a 50 pound one please ? I saw you on Markus Lanz’s show yesterday and realized that I had seen you live in Cambridge when I still lived there. I had not heard about your S-Bahn video yet. I just found it cool to see you on that show. I love your music. Just saw a video with you and your friend playing Prince ‘Kiss’ on a subway on Facebook, and just wanted to say I absolutely adore you. Rock on! Fantastic performance of ‘Kiss’ in the S-Bahn! The fun has started!! And a very nice CD came along with it, thank you. I will spread the cajon sound all over The Netherlands. I am from India,currently in Bangalore. I would like to know if you ship the cajon to India. And I dont know much about the instrument so you will have to recommend one for me. My musical background: I am a tabla player and a little drum(which is self taught). And please include all the price. Hello! Good to hear from you! We have all details of our drums on our webshop, you should check it out! I would go with the Pro Plus model, a great model for an existing player with a drum technique already. I stumbled onto your videos and am LOVING everything you’re teaching 🙂 Thank you so much for being such an incredible resource. I recently moved back to the States from France with my Soul Hip Hop duo and we recently decided to break away from our full band and really give this hybrid acoustic duo the wings it deserves. I’m new to the Cajon, but your videos are really helping me fine tune my playing and production skills. Would love to see you with your band sometime! 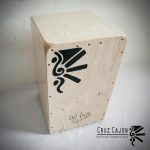 So do you have a US Outlet for Cruz Cajon so I can avoid international shipping rates? Also, really looking forward to the lesson video. At present we don’t have any Cruz’s stocked in USA yet but we are working on it! Hopefully soooooon! I am also very much interested in your cajons, and I will be following your lessons. Very well organized, and your technique is low-effort and clean it inspires to get better as a beginner player. I am adding cajon, moving from djembe as a performer and teacher. Thanks for organizing these lessons. Apologies for the ages it took to reply, somehow I missed your comment! Thanks for your very nice words on my lessons! I am releasing a DVD soon too so keep an eye out! 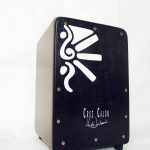 Did you know that most of ouyr Cruz Cajon sales go to US? We ship directly to you, it;s fast, safe and secure! Check out our range on our webshop! We just received our new stock and they are simply magnificent! Olá, sou do Brasil e assisti o seus vídeos no Youtube. Parabéns pela musicalidade. Você faz um som muito bom! Hey, Heidi, the e-mail from faraway China, I am your fans. Please forgive my English is really bad, this message is translated by GOOGLE it. I ask you which city in which country? Me and my friends are Chinese street performers. I’m going to be able to raise enough funds to pleasure of seeing you.